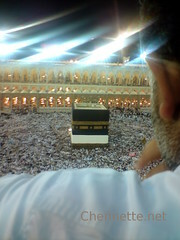 The family returned from the Hajj on the 29th of December 2008. Last year That was on Monday and today is Friday. But we arrived with the usual Hajji cough, cold, flu, allergies, tiredness from 3 days of travel, good cheer from the completion of the Hajj and the communion with 4 million people from all over the world…everything but our luggage. Four of us, and the only luggage we got was our little 2-gallon container of Zam Zam water! Lilandra and I will nonetheless try to chronicle our journey at our Hajj blog for posterity, and maybe for the benefit of any future hujaaj*. There are some really funny stories – especially the ones that were not so funny to us at the time. Wily old ladies and the unspoken battle for sleeping ground. The shock of the stooping toilets. Flat tyres and deserts. Saudi seasoning = salt, salt, and salt on the table. This entry was written by Chennette and posted on January 2, 2009 at 3:29 pm and filed under family, Hajj, life, travel. Bookmark the permalink. Follow any comments here with the RSS feed for this post. Post a comment or leave a trackback: Trackback URL. Glad you and your luggage made it home safely… even if the luggage took a few detours. Hi there! Happy new year. I’m glad you had a safe journey. We missed you. That picture seems like something you would see in Newsweek or Time. Excellent framing.Is this from a Sony Ericsson k850i? thanks aka when I couldn’t get a free spot, I went with it – there’s no point in zooming. yup, k850i – that was my splurge purchase last year – after my iPod died and I lost my little nikon P&S (both essentials for being on planes and whatnot).I haven’t figured out how to get the exposure right in camera, but a little tweaking after makes the shots ok. The K850i is very good from what I see. It’s probably best to tweak after the pic. I have a Nokia N95 and I never bother to figure out if the settings can be adjusted. The Flickr pics are good.